Look-a here folks, it's time to delve deep inside and ask yourselves the question: are you ready to rock? Your attendance at tonight's show holds the answer, as San Francisco's killer accordion extravaganza pumps out their unstoppable "wall of wheeze", blazing through musical barriers like a squeezebox on fire. From classic rock and funk to swing—and, yes, polka—this absolutely unique (we hope) band proffers meticulously crafted arrangements with sterling vocal harmonies and a sense of humor that just won't quit. 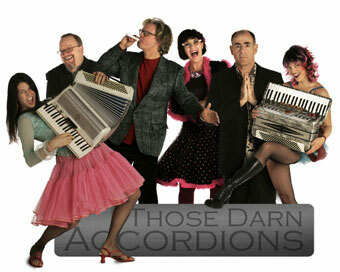 Blowing into the Freight tonight on their 20 Years, 20 Cities Tour marking two decades in the sonic mayhem business, TDA promises to forever rearrange your understanding of the accordion. Fronted by lead singer/squeezebox wizard Paul Rogers and bellows-pumping babes Carri Abrahms, Susie Davis, and Suzanne Garramone, the six-piece band mixes solid keyboard chops with a groundbreaking use of guitar effects, pedals, and amps to produce a super-cool sound completely unlike your grannie's accordion. Drummer Michael Messer and bass player Lewis Wallace anchor the band, providing a firm foundation for the huge slabs of squeezebox virtuosity layered on by the manic TDA accordionists. With a whole passel of awards under their belts, from Keyboard Magazine's Band Photo of the Year to S.F. Bay Guardian's 1997 Bumpersticker of the Year, this is surely a group that deserves your devotion!